PM and President take part in a ceremony marking the 50th anniversary of the execution of Mossad agent Eli Cohen in Syria. Prime Minister Binyamin Netanyahu and President Reuven Rivlin on Monday participated in a ceremony in memory of Mossad agent Eli Cohen, on the 50th anniversary of his execution in Damascus. Mossad Director Tamir Pardo, former Mossad directors, senior Mossad officials and members of the Cohen family – including his widow Nadia and their three children and his siblings – also attended the ceremony, which was held at the President's Residence in Jerusalem. 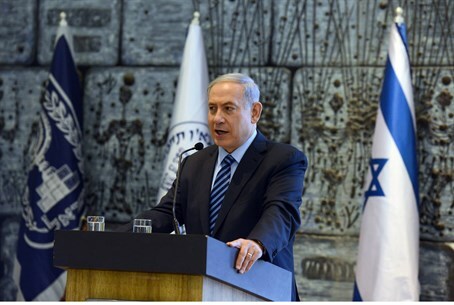 “Our presence on the Golan Heights is – to this day – of great importance. Imagine the Syrian army or rebel forces or extremist Islamic terrorist organizations or Hezbollah, under the command of Iranian generals, coming down from the Golan Heights to the Kinneret and the valleys of the north. Thanks to Eli Cohen this has been prevented," he added. President Rivlin said at the ceremony that “Eli Cohen was an extraordinary hero of Israel. He merited that the entire country would know him well and maintain his legacy. We, citizens of Israel, will forever remember Eli Cohen as a true hero, who sacrificed his life in the defense of our security and for the freedom of our country." Rivlin also said, This memorial ceremony marks a debt of honor to our brother Eli Cohen, and to his legacy. An eternal legacy which forever remains in our hearts. The legacy of our 'man in Damascus', for whom the safety to the State of Israel was ingrained in his very being." Eli Cohen, who was born in 1924 in Egypt, immigrated to Israel at the age of 33 where he began collaborating with Israeli intelligence agencies and in 1960 was recruited to Military Intelligence's Unit 188. After having trained as a spy, Cohen was sent by Unit 188 to Argentina, where he built his identity as a businessman of Syrian descent. In January 1962, after successfully integrating into Argentina's Syrian community, Cohen traveled to Damascus, quickly becoming friends with top government officials and senior military officers. From these men, he attained classified information about the Syrian army and its connections with Palestinian organizations - information that would later provide a dramatic contribution to Israel's victory in the Six Day Way in 1967. Cohen was captured in January 1965 while broadcasting information to Israel during a Syrian regime imposed 24-hour period of radio silence. He was publicly hanged in Damascus' Marjeh Square in May, having undergone months of torture and interrogation. Buried in Damascus, the Syrian government has rebuffed all requests to allow Cohen to be brought home for burial in Israel.